Motifs represent a theme, an object or creativity or an idea. Motifs have been used in jewelry, clothing or home furnishings in India for more than a millennium. Undoubtedly, one of the most popular motifs used in India is the peacock motif. Peacock has earned the glory of being the national bird of our country and Hindus consider it as a pious bird. Peacock is associated with Lord Krishna and Lord Muruga according to Hindu Mythology. The peacock feathers consist of many colors including the crescent sheen of bright blue and green. A phenomena known as interference gives the shimmer in the feathers of peacock where each feather consists of tiny flat branches of feathers. Recreating the unique color of the peacock feather has been a challenge, but a favorite, to Indian craftsmen over the centuries. It has been a distinct feature of Indian jewelry and clothing and is not a trend that emerged in recent times. This motif has the old world charm which makes any saree, lehengha or a bag a style statement while exhibiting its ethnicity and tradition. Peacock motifs have ruled the fashion industry for many years and it continues to be experimented in different ways. A saree or a lehengha embellished with peacock motif or an embroidery work will make you stand out in a crowd since it gives a royal and prestigious look. The gorgeousness of the peacock motif would go well with weddings or any occasion which requires you to be dressed up to the nines. 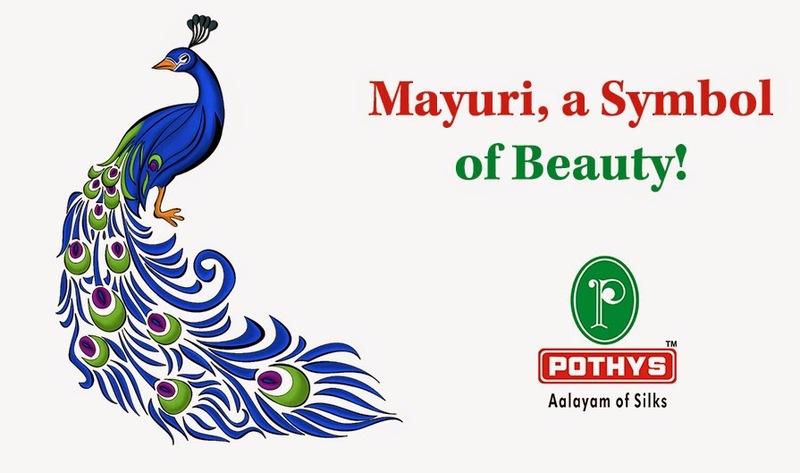 Inspired by Indian roots and tradition, Pothys presents a wide collection of sarees with peacock design in different forms. Be it an informal gathering or a formal one, you can never go wrong with these sarees with the peacock motif.